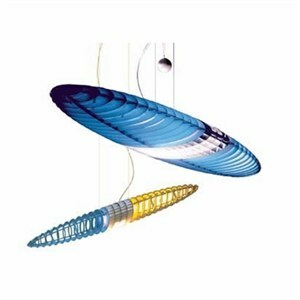 The Titania pendant light designed by Paolo Rizzatto and Alberto Media is a striking, and truly unique light. The elliptical structure of its outer casing, composed of blades, serves simultaneously as a non-dazzle screen, a reflector of the central light source and a heat dissipater. Five pairs of polycarbonate interchangeable filters determine the varying colours of its lamellar body. In fact Titania can be colored as desired, by a simple movement of the hand to slot the different filters in and out and to give the lamp a "dematerialised" color - while always maintaining an emission of white light! A touch of the fingers is enough to send it into a variety of suspended positions and, depending on which angle it is seen from, it assumes completely different appearances: transparent if seen from the front, and as a solid body if seen from the side. The spherical counterweight, allowing its up-down adjustment, can be inserted or removed at any time. Titania is a dynamic and surprising lamp, suitable for a wide variety of settings.